Change Control management is needed to prevent chaos when changes happen rapidly to the project. Changes are reviewed by Project Manager and Senior Developers/Testers. Project Manager is responsible for estimating impact of changes to Project Plan. If change has technical merits, side-effects, or it is estimated to break project plan, objectives of the change should be either weakened, or it should be rejected (if it does not concern critical requirements), or it should be billed at a separate price. Changes are sent to entire project team by email, and discussed at project team meeting. 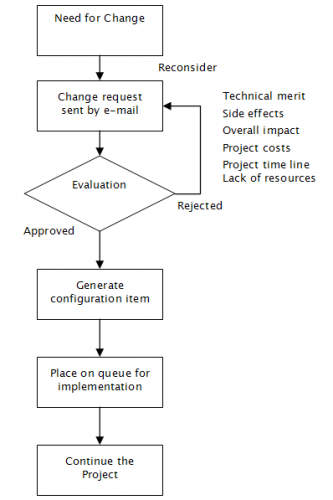 Changes are documented and stored in Version Control System for the sake of Configuration Management.